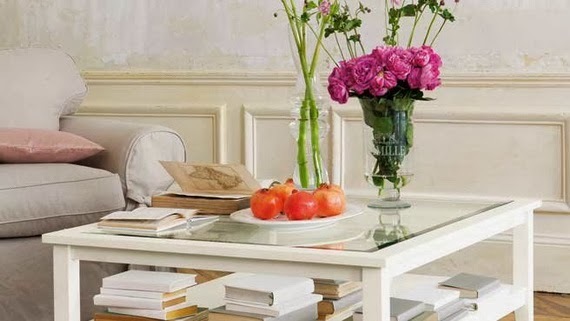 Not only bedrooms, living rooms as well can be decorated by charming touches to create an attractive romantic style; it will add a refreshing & pleasant ambience in summer and a warm look in winter. Interested to know how? Check out those ideas. The first way to add a very romantic look o the living room is by adding feminine colors (but not too much); one wall in a charming color for example or maybe decorated by soft wallpaper motifs, decorative accessories in subtle colors…etc. in the first design we see how pretty looks this purple sofa; it will match with white walls and white furniture very well with some small touches of pink or light grey if you want. If you choose to use wallpapers for a romantic decoration; know that they are enough to create the desirable look in the room and it won’t be necessary to change furniture. 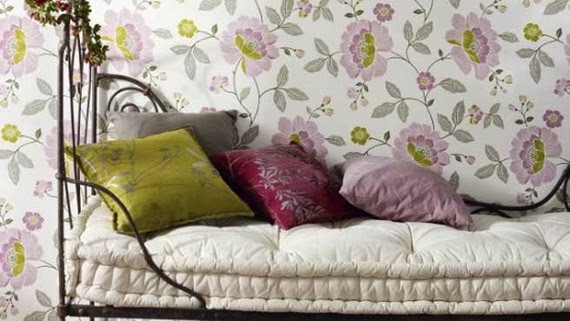 In this case opt for floral motifs; floral walls are not only dedicated to classic decoration, it is used now very beautifully in modern interiors; one wall decorated by floral wallpaper will be very sufficient. Flowers & natural motifs can also be present in other deco such as planter, vases and natural plants.